Raltarn is a young man trying to make his way in the world, improve his skill in magic, and win the hand of his beloved Shanu. None of those are easy when their country is at war and Raltarn's guardian, his uncle Tomaz, is never sure which side of the law he wants to be on. The Schemes of Raltarn & Tomaz is set in the same world as The Dragonrider Series, but takes place about a thousand years earlier. The series currently has only one book, The Mirrors of Elangir, but I'm writing another, which I aim to release in late 2018 or early 2019. 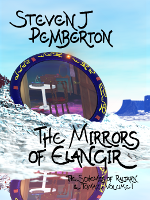 The Mirrors of Elangir is a hunt for a magical treasure that could pay a dowry - or win a war. Raltarn and his uncle are entrepreneurs, struggling to make an honest living - or failing that, any sort of living - as Raltarn scrapes together a dowry for his fiancée Shanu. Shanu's father, tired of waiting, gives Raltarn an ultimatum - double your fortune in three months or the wedding is off. Click here to read the first ten chapters. - Amazon, for your Kindle or in 6" x 9" paperback, in the United States, the United Kingdom, Canada, Australia, Germany, France, Italy and Spain. - The paperback is also available from CreateSpace. - iTunes for Apple devices. ISBN 978 131 177 686 0 (ePub edition), 978 150 034 334 7 (paperback). Click here to read the sample of the Kindle edition in your browser. If you enjoy it, you can buy the book from the same window. Click here to read the first ten chapters on my site. Take this quiz on Goodreads for a chance to win an electronic copy of the book. The answers are all in the first chapter. Here is the bonus material for The Mirrors of Elangir, including maps and deleted scenes. If you're interested in reviewing any of my books, please email me (webmaster (at) pembers (dot) net) with a link to where I can read some of your reviews (so I know you're serious about reviewing). Please state which book(s) you're interested in and which format you want. I can supply .mobi (for the Kindle), .epub (for most other ereaders) and PDF. I don't normally give out print copies, but I occasionally have spares lying around, so if you want one it's probably worth asking just in case.